Based in Burnley, we’ve put our 20+ years worth of laser experience to good use by removing tattoos for clients who travel from all over the UK including, Birmingham, Manchester, Leeds, Liverpool, Sheffield, Newcastle, Scotland and Ireland! How can PicoSure achieve better clearance in 75% less time? 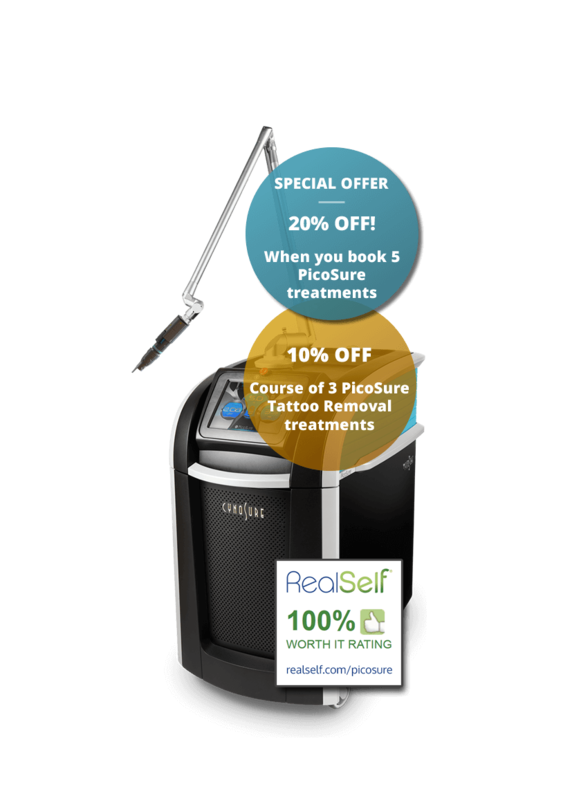 Whilst traditional laser tattoo removal often requires between 10 and 20 sessions to achieve good clearance, the PicoSure machine can remove your tattoo more completely in fewer sessions. How is this possible? 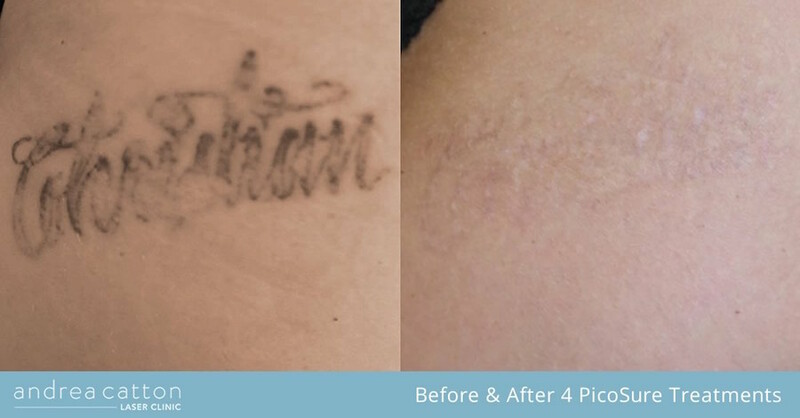 Traditional laser tattoo removal machines heat the ink in your tattoo breaking it into small ‘pieces’, but the patented PressureWave™ impact from the PicoSure laser shatters the ink into tiny particles – these are more easily disposed of by your body. 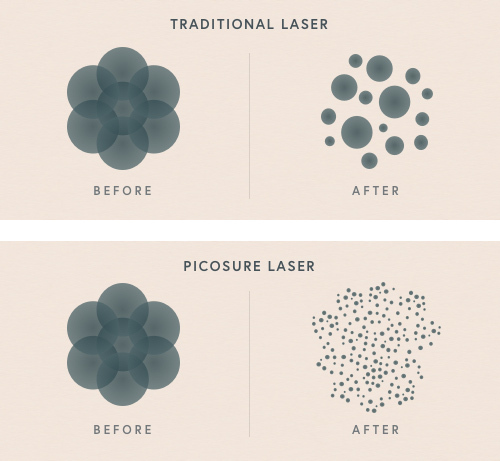 The illustration gives a simple view of how the PicoSure laser breaks down the ink in your tattoo into tiny particles. View our before and after picture gallery. PicoSure is FDA approved and you can read what our clients say about their experience here. 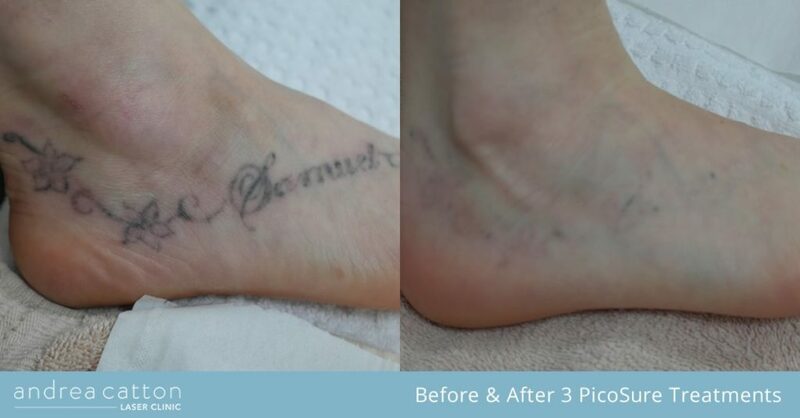 Due to the unique way the PicoSure laser ‘shatters’ the ink on your skin, you’ll need fewer sessions. 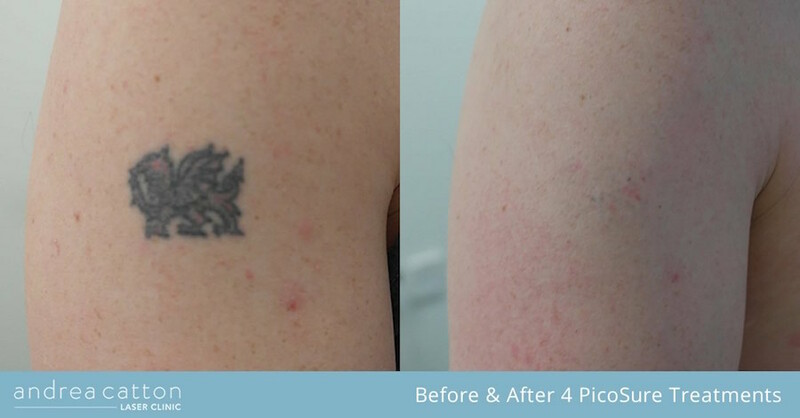 Traditional laser tattoo removal would take on average 10 – 20 sessions for a small professional tattoo (up to 5cm sq), whereas 4 – 6 sessions* using the PicoSure laser will be enough to remove your tattoo leaving behind almost no trace. 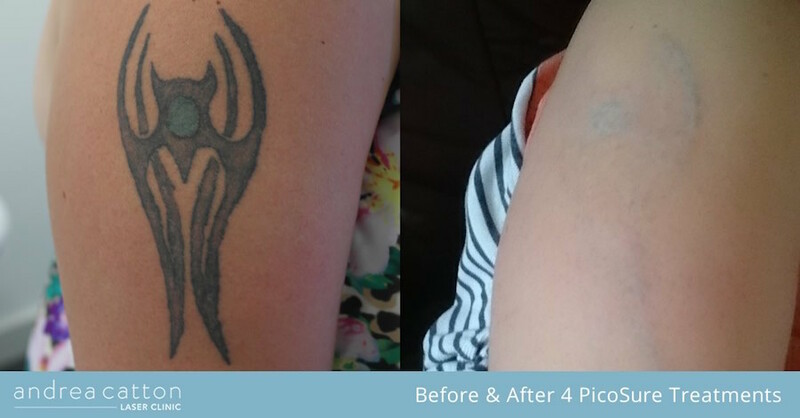 So that’s less time in the clinic and the removal of your unwanted tattoo sooner! It is recommended that you wait a minimum of 6 weeks between sessions to allow the treated area to heal. 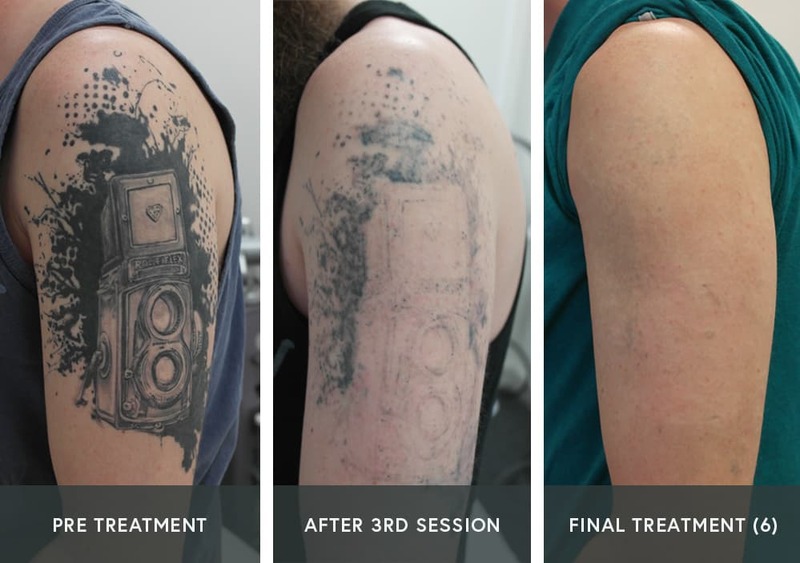 To help speed up your recovery and improve the overall results we advise you to follow our laser tattoo removal before and after care instructions. How much does PicoSure cost? This is dependent on two key aspects – the size of your tattoo and the type of tattoo. A larger professional tattoo will require more sessions than a smaller amateur tattoo, and the sessions will last longer too. 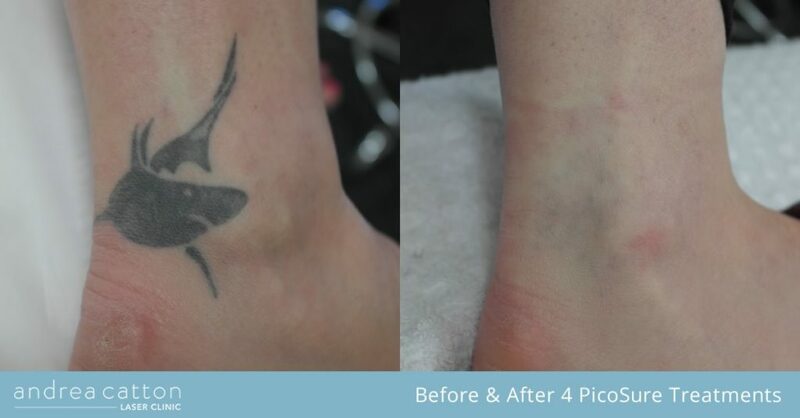 A typical small tattoo, 5cm x 5cm, will take around 4 – 6 sessions to remove and cost around £1280 – £1600 in total. View our pricing guide below. Consultations require a £50 deposit, which is deducted from any future treatments. 48 hour notice is required to move or cancel an appointment or the deposit is forfeited at our discretion. Not sure what size your tattoo is? Scroll down to view our tattoo size guide below. Visit our pricing page for more information and visit our offers page for the latest PicoSure package deals. We created this tattoo size guide to help give you an idea of what size classification your tattoo falls under. 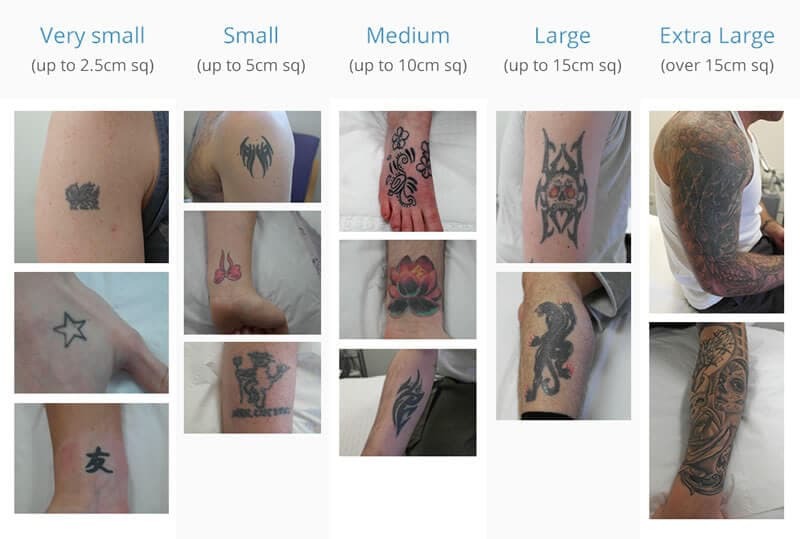 Unlike other clinics we are very flexible and always look closely at the size, shape, design and density of each tattoo to give a personalised and accurate price. If your tattoo has gaps in the design, we take this into consideration and adjust the price accordingly. If you are unsure of your tattoo size then please don’t hesitate to send us a picture via our contact form and we’ll get back to you with an accurate price. What ink colours can PicoSure remove? 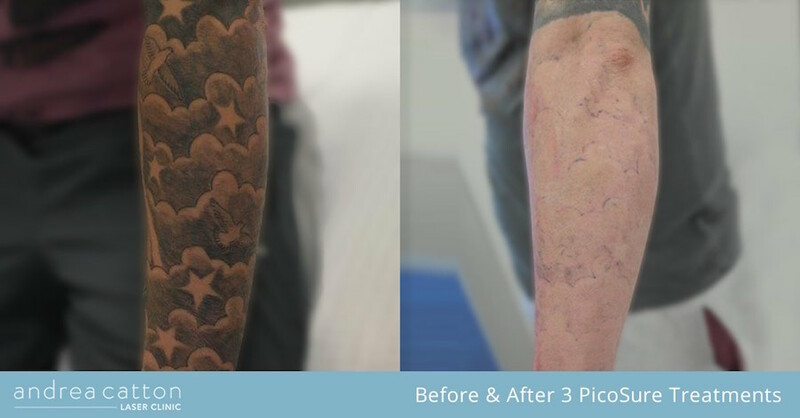 The PicoSure laser can achieve impressive tattoo clearance on darker inks from just 1 session. 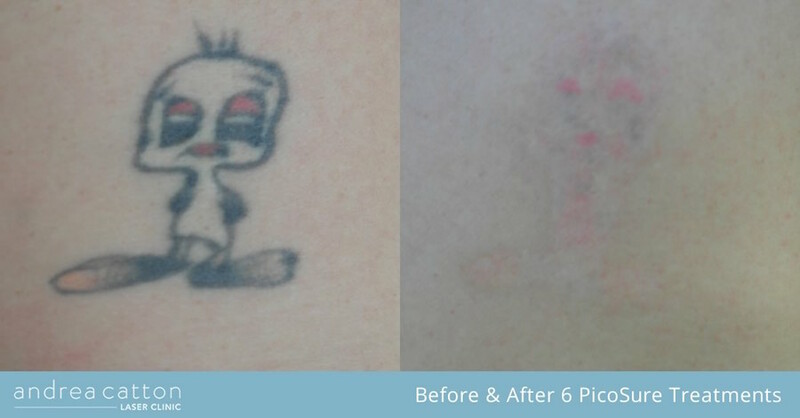 And now that we have the 532 nm upgrade, we can offer our clients quicker removal of red, orange and yellow tattoo ink. 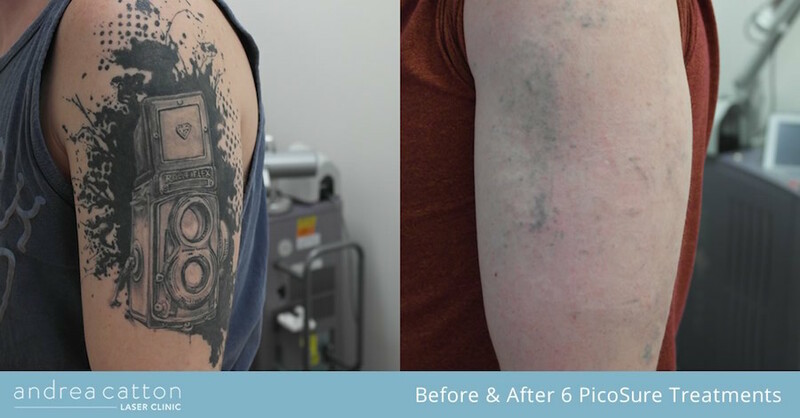 Couple this with our PicoSure Boost™ option for the removal of denser ink and final clearance, the PicoSure truly is the all-in-one tattoo removal solution! We’re just off the M65 in Burnley with free parking facilities. Below are some estimated travel times by road. We’re also close to 3 major airports if you’re coming from further afield. If you do decide to fly, we can arrange a preferential rate for you to be picked up from the airport – ask when you call to book. There are natural side effects that do occur and are positive signs that your body is already starting to heal. They include, white frosting, blistering, scabbing, swelling and itching. 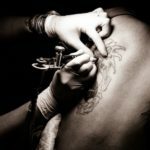 For more detailed information, read our blog post titled, “The Truth About Laser Tattoo Removal Side Effects“. 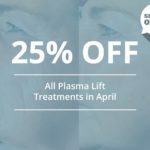 Will PicoSure laser treatment hurt? Customers who have previously had other tattoo laser treatments, such as the RevLite, reported that the PicoSure laser was significantly more comfortable. To better visualise the sensation, if you think about having someone flick an elastic band onto your skin, it’s about the same sensation as that. For more information on this question head on over to our blog and read this post. How long do you have to wait between sessions? A minimum of 6-8 weeks to allow for the treated area to recover. Does PicoSure work on darker skin types? There is a higher risk of hyperpigmentation and hypopigmentation with the PicoSure laser on darker skin tones. As such, we do not recommend PicoSure, but instead recommend our RevLite laser which is the safest laser for darker skin types. Can I go in the sun before and after treatment? Sun exposure or sunbeds should be avoided for the duration of the treatment course and for at least 4 weeks prior to treatment commencing. The Clinic advises the use of reputable sun protection of factor 30+, or protection of the treated area from sunshine/sunbeds. Treatment of an area after recent exposure to sunlight or sunbeds could result in permanent hypo-pigmentation of the treated area. Can PicoSure remove heavily inked tattoos? Yes – our recently upgraded PicoSure machine now has a Boost™ mode option. This option enables amplified pressure and shorter pulse widths resulting in an increased shattering effect to the ink. We use the Boost™ option on heavily inked tattoos in the latter sessions, and for clients where the ink has almost disappeared and requires a final clean up to finish the job off. PicoSure Boost™ comes at no extra cost. We’ve wrote a blog post about the PicoSure Boost™ for more information. 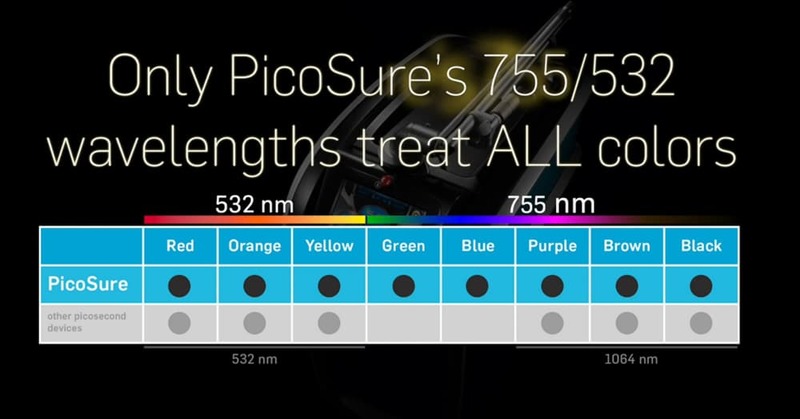 What ink colours can the PicoSure laser remove? 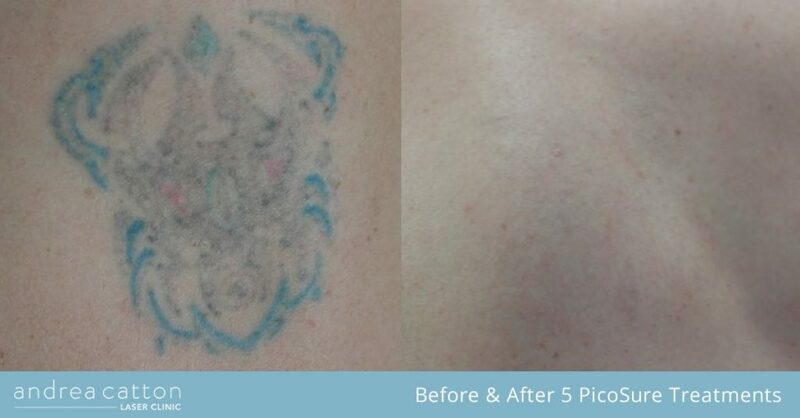 The PicoSure laser can achieve impressive tattoo clearance on darker inks from just 1 session. And now, we have the 532 nm upgrade, which enables us to remove the more stubborn colours of red, orange and yellow tattoo ink in record time. 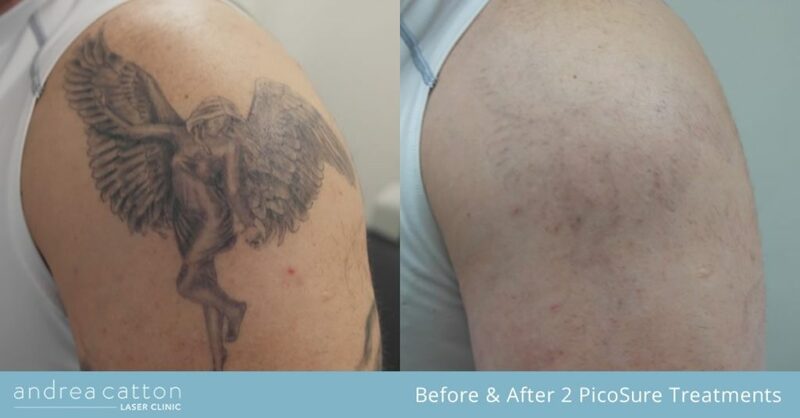 Couple this with our PicoSure Boost™ option for the removal of denser ink and final clearance, our PicoSure laser really is the all-in-one tattoo removal solution! Is there any specific aftercare advice? Yes, we provide you with an aftercare leaflet on the day of your treatment. The main advice to note is to avoid sun exposure (including sun beds) for at least, 4 weeks prior to treatment and 4 weeks after treatment. If it’s not possible to avoid the sun then don’t stay exposed for long periods and always use a sunscreen of a minimum SPF30 on exposed areas. It’s important you follow the advice for a speedier recovery and optimum results. What is the minimum age to receive treatment? The minimum age for PicoSure tattoo removal is 18 years.